Got out for a post-Christmas excursion with brother-in-law. And, of course, testing some gear for some eventual bigger trip (Greenland). All good. Great gear store there in New Paltz, Rock and Snow, def worth stopping through. Did the short loop around the lake — a little snow — was hoping for some x-cross country skiing but rain wiped that option off the map. For now. Rock and Snow rents ski’s — so just waiting for the snow. iTopoMaps was ready if needed (wasn’t needed) downloaded Quad night before. Otter Defender Case also seemed fine in 30 degree weather, though having to take gloves off to motivate the iPhone will become a pain point in anything much colder. 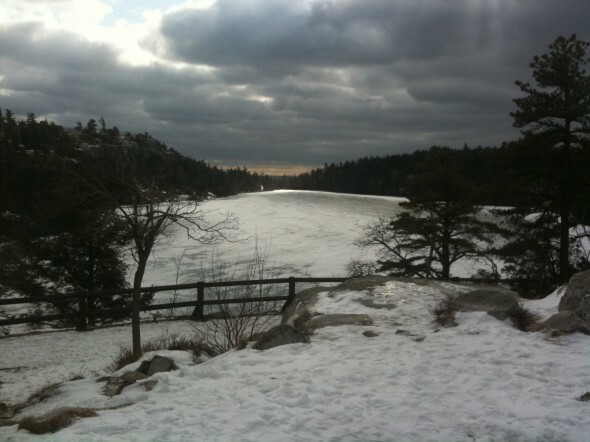 This entry was posted by John Pasmore on Monday, December 28th, 2009 at 5:11 pm	and is filed under New York, Outdoor and tagged with Gunks, Hike, itopomaps, Lake Minnewaska, New Paltz, Otter Defender, Shawangunk, Ulster County. You can follow any responses to this entry through the RSS 2.0 feed.